I don't have a lot of original singles by Bread, although I do like the band. They are simply quite hard to come by if you're not prepared to pay a lot for them. But sometimes I do get lucky. 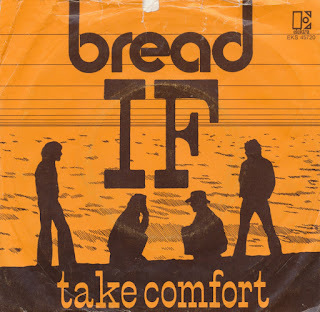 This original release of 'If', one of the band's most sentimental ballads, suddenly turned up in one of the many racks in Leiden's biggest vinyl shop, and of course I took it immediately. Released in 1971, it was the first of only three hit singles in the Netherlands. It reached number 19 during a chart run of four weeks. In the USA, the single got to number 4, but in the UK it did not chart.